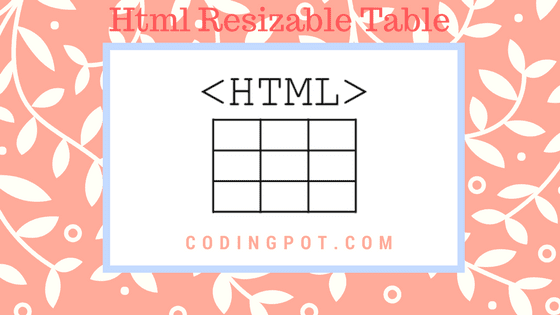 Home Angularjs Html resizable table in angularjs. For this tutorial, we have used AngularJs, we will create this tutorial using AngularJS and create some the component or directive. AngularJS is a structural framework for dynamic web apps. It lets you use HTML as your template language and lets you extend HTML's syntax to express your application's components clearly and succinctly. There so many versions are available for AngularJS. Open the visual studio or visual studio code for this tutorial, but we use visual studio for creating this tutorial, so open visual studio and create new empty project, after created empty project we will create some important folders like ( bower_components, controllers, scripts, views ). These all folders are useful, the first folder is (bower_components) , in this folder we installed the angular, jquery, jqueri-ui. In the second folder (controllers) we will create controller file but before create controller file we must have to create modular file for this tutorial and this modular file is create in (scripts) folder, the last one is HTML page in folder of (views). We have installed angular, jquery and jqueri-ui from bower component site or using commands in the ( bower_components ) folder. All the required packages are installed, now we create the modular file (app.js) in scripts folder. A modular file is main part of the whole project, because we create the other (.Js) file based on modular. We have created tableresize controller using modular name and Inject $http and $scope in controller function. For the table resize we have to implement the directive. This directive we use view side for resizing the table. We can create the directive using the modular name and we will create it the tableResize controller file, you can create directive in different file like directive.js but in this tutorial we will create it in controller file. Above we have created “resizable” directive, a resizable directive call when table is initialize. In directive some of the attributes are used like ‘restrict’, ‘scope ‘, link function. When we resize the table then call the elem.on(‘resize’) function with two parameters of “evt” and “ui”. Now we will see how to call this directive in UI side and when call this directive, for this we have create view file that is HTML page in view folder. After create HTML page we have to inject the component files, project files or other files. tag and apply resizable directive on that table heading. You can see in above HTML we have called the directive of resizable and this directive call when on-resize function call. You can see it in every table heading. In resize function we pass two parameters “$evt” and “$ui”. If you want to design the better table then you can write your own css and apply that css in the table or you can use Bootstrap, It is very useful for the designing purpose and there are many versions are available, you can download it and add in your project. After added you can use Bootstrap class on HTML page. Here we have only call resizable directive and second one is on-resize attribute with the resize function. You can create it in your project by following above instructions.